DETROIT — No surprises among the Lions who won’t dress for the final preseason game against the Bills. Out for Detroit are RB Stefan Logan, WR Titus Young, CB Chris Houston (ankle), S Louis Delmas (knee), CB Bill Bentley (shoulder), RB Kevin Smith (ankle), LB Travis Lewis, Kyle Vanden Bosch and Corey Williams. Again, John Wendling will start at free safety with Erik Coleman at strong safety. The roster must be cut from 75 to 53 by 9 p.m. on Friday making this a crucial game for several players. ALLEN PARK — Four starters — Calvin Johnson, John Wendling, Corey Williams and Brandon Pettigrew — were back at practice today (Tuesday) after sitting out Monday afternoon’s practice. Also on hand Tuesday was cornerback Kevin Barnes who the Lions received in a trade from the Washington Redskins for an undisclosed draft pick. He’s wearing No. 32, the same number worn by Aaron Berry. Still missing from practice were CB Bill Bentley (shoulder), CB Chris Houston (ankle), RB Kevin Smith, DE Lawrence Jackson and Louis Delmas (knee). On Monday Titus Young had limited participation, but was out on Tuesday. Unbelievably, as I write this, there are 0 bids on ebay for an Ndamukong Suh related item. Yes, you could be the proud owner of car accident paint chips from Suh’s 1970 Chevy Coupe following his accident in Portand, Ore., last winter while he was suspended from the Lions for the stomp. And, yes, the bidding starts at the unbelievably low price of $5.99. Shipping is 69 cents. The item is classified as used. Instead it should be useless. Along with getting drafted in the first round, come big expectations. 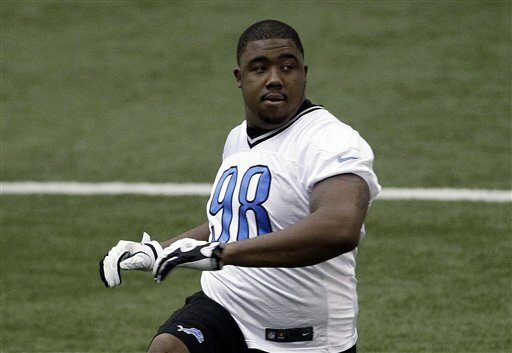 So far defensive tackle Nick Fairley, the Lions 13th overall pick in 2011, has not delivered. In his rookie season he was hampered by lingering effects from a broken foot. He showed glimpses, but couldn’t play consistently at a high level. This season he’s healthy. Yet so far he hasn’t really shown us much. He’s got another chance on Saturday night at the Oakland Raiders in the Lions third preseason game. “He struggled early when we started camp and he’s starting to get into shape,’’ defensive coordinator Gunther Cunningham said this week. “A lot of these young guys like Willie Young for example, not being mature (as a rookie), (Fairley) lacked some of that maturity. He had to work overtime. Fairley should be even more motivated after embarrassing himself and the team with two offseason arrests — one for drunk driving, one for marijuana possession. He faces possible suspension by the NFL. He also faces tough competition among defensive linemen. Ndamukong Suh and Corey Williams have lined up with the starters in camp. Fairley is in the second group along with Sammie Hill. Andre Fluellen has had a good camp and is versatile. Time for a healthy Fairley to show what he’s got. ALLEN PARK — Jahvid Best remains the mystery man of Lions training camp. More than 10 months since his last concussion, the Lions running back has still not been cleared for contact. The day — actually Aug. 31 — is fast approaching when the Lions have to decide whether to put him on the physically unable to perform list. This would mean no practice and that he would miss the first six games. “When we get to ... no, no decision has been made right now,’’ coach Jim Schwartz said on Thursday. Placing Best on the PUP list would give Best and the Lions time. “Well particularly with concussions, his time is always beneficial. You’ve seen that with a lot of other guys that have come back. That would buy us time if we had to cross that hurdle,’’ Schwartz said. Best is on a week-to-week basis, not day to day. Weeks ago he said he no longer suffers any concussion symptoms. He was able to participate in offseason work because it was no-contact. “He’s doing great. He’s working out hard, he’s just not cleared yet,’’ Schwartz said. The coach said he wouldn’t compare Best’s concussion problems to those of the Pittsburgh Penguins’ Sidney Crosby because the sports are too different. “Again, you can’t judge one guy on something else. Everybody’s body is a little bit different, everybody’s reaction is a little bit different,’’ Schwartz said. Crosby suffered a concussion in early January 2011. He was out 10 months, played eight games and then was sidelined again for three months before he played again. ALLEN PARK — R.J. Archer was brought in by the Lions as a camp quarterback, fourth on the depth chart. Archer, an Arena League quarterback, was released today (Thursday). The leaves rookie Kellen Moore as the third quarterback behind Matthew Stafford and Shaun Hill. The Lions signed 32-year-old veteran Kassim Osgood, a Pro Bowl special teams player and a wide receiver. The team also released cornerback Drew Coleman and defensive end Michael Cosgrove from reserve/injured. The Lions will play their third preseason game on Saturday at the Oakland Raiders. The first roster cut from 90 to 75 is due at 4 p.m. on Monday. ALLEN PARK — The Lions’ injury list has dwindled as they approach the third preseason game on Saturday at the Oakland Raiders. Running back Mikel Leshoure, who has never played in a game for the Lions, practiced again on Wednesday and is on track to play against the Raiders according to coach Jim Schwartz. It will be his first game since he was drafted in the second round in 2011. Leshoure is coming off an hamstring injury which forced him to miss more than two weeks of camp. Last year he tore his Achilles early in camp and was placed on injured reserve, missing the entire season. He split reps with Kevin Smith with the starting unit in Wednesday’s practice. Returning Wednesday were defensive tackles Sammie Hill (back) and Corey Williams (knee). 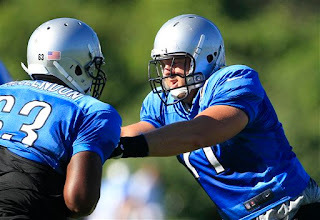 Kyle Vanden Bosch (knee) went through a whole practice after just working individual drills on Monday. The players were off on Tuesday. Still missing were Stefan Logan (ankle), Travis Lewis (knee) and Louis Delmas (knee). Pride was on the line after practice with a few foot races. Rookie Bill Bentley beat Alphonso Smith twice. Chris Houston and Jonte Green split a pair of races. For more on that see TheOaklandPress.com later today. 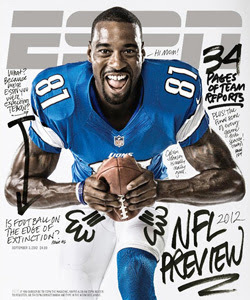 Calvin Johnson is one of the most unassuming, humble professional athletes you will ever meet. Plus, the Lions Pro Bowl wide receiver has one of the best all-time smiles. It’s nice to see him get a little more recognition for himself and the Lions by landing the cover of ESPN The Magazine’s NFL preview issue. It hits the stands on Friday. It’s a good-looking cover too. And, to my knowledge, there’s no curse associated with the ESPN mag cover. Tom Kowalski will not be forgotten. While the Aug. 27 golf outing to honor charities in his name is sold out, there are still dinner-only tickets available. Also, the online auction is up and runs through Sept. 4. It will help raise money for Kowalski’s two favorite charities — Team Joseph (Duchenne Muscular Dystrophy) and Our Children’s Fund (West Bloomfield Schools) — along with Detroit Lions Charities and the Detroit Tigers Foundation. The online auction started Sunday and runs through Sept. 4 at 2 p.m.
Go to KillerCares.org for information. — Lions suite for 12 people vs. Indianapolis Colts (and Andrew Luck) on Dec. 2. — Four tickets to Red Wings vs. Sidney Crosby and the Penguins on Monday, Nov.19. Includes pregame visit in the press box with Mickey Redmond. — Chance for 2 people to sit in on the Drew & Mike show at WRIF for a morning. — Four tickets for Wolverines vs. Buckeyes in Columbus on Nov. 24. — Drew and Matt host two groups of three at their catered pregame bash followed by the Wolverines vs. the Illini at the Big House on Oct. 13. — Four Champions Club tickets for Tigers vs. Twins on Friday, Sept. 21; all four will be on field to watch pregame batting. — Four tickets on the 50-yard line for Lions vs. Bears on Dec. 30 at Ford Field. Includes pregame press box visit with Dan Miller and Jim Brandstatter. — Virtual Tom Kowalski Day: Two people will go to the Fox2 pregame show at Chelli’s with Woody Woodriffe, then will be whisked to the press box for lunch and the game. After the game they will attend coach Jim Schwartz’ post-game press conference. — Framed poster signed by all members of both teams from the 2011 Presidents Cup. Includes signatures of Tiger Woods, Phil Mickelson, Ernie Els, Greg Norman and Fred Couples. ALLEN PARK — It’s getting to a point where it will no longer be huge news when Mikel Leshoure practices. Leshoure practiced today (Monday) in a back-to-back situation after going through practice on Sunday. He’s not sure if he’ll be ready to play in the next preseason game which is on Saturday at the Oakland Raiders. “I’m just trying to do whatever I need to do to get back, hopefully I can put a series of practices together to allow myself to go out and play but taking it day to day we don’t know, we’re going to see,’’ Leshoure said. It’s critical that he see some preseason action since he hasn’t played in a game situation since college. And he will miss the first two regular season games due to suspension. He’s missed much of this camp with a hamstring injury which happened on the second day of camp. Leshoure tore his Achilles early in training camp a year ago and missed the full season. Monday was also a good day for wide receiver Ryan Broyles who played in Friday’s preseason game. It was his first back-to-back practice since the first few days of camp. Also at Monday’s practice, Kyle Vanden Bosch participated in individual drills for the first time since injuring his knee two weeks ago. Titus Young, who missed Sunday’s practice with soreness, was excused from Monday’s practice. Defensive tackles Sammie Hill and Corey Williams were still out along with Andre Fluellen. Linebacker Travis Lewis, who injured his quadriceps muscle in Friday’s win at Baltimore, also sat out. Safety Louis Delmas (knee) is still out and coach Jim Schwartz said he is still week to week. 1. CB Jacob Lacey has played more at right cornerback with the ones (the starters) during training camp this week. That put rookie Bill Bentley at nickel more often. Coach Jim Schwartz said not to read to much into it (or anything we see at camp). Against Cleveland, Bentley got the start and hauled in one interception. Wouldn’t be surprised to see Lacey start. This is a good battle to watch. 2. RB Joique Bell had a solid game last week, but it was against the scrubs of the Browns’ defense. Let’s see if he gets a few more carries against the Ravens first or second unit. While the Lions mostly know what they have in Kevin Smith and Keiland Williams, Bell has no NFL experience. So the preseason is key for him to try to make the 53-man roster. 3. DE Nick Fairley has not been a standout at camp or didn’t make any key plays against the Browns. Unlike last year, he’s healthy so he should be throwing his weight around. He should be extra motivated due to his bad judgment in the offseason. He’s one to watch. Cliff Avril will be playing catch-up, seeing time in his first preseason game on Friday when the Lions play at Baltimore. 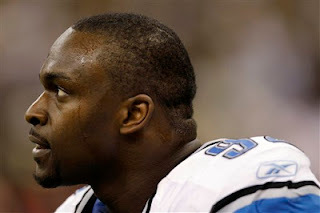 After a week-long holdout, the Lions defensive end wasn’t ready for the preseason opener last week against the Browns. Avril, who signed a one-year $10.6 million tender, has seemingly stepped in right where he left off last season. Like the other veterans Avril works to improve each day. ALLEN PARK — While rookie Bill Bentley came on strong early in training camp, that starting position at right cornerback is not settled yet. Cornerback is one of the most competitive battles in camp and Jacob Lacey is definitely in the mix. It’s possible he’ll have more of a role in Friday night’s preseason game at Baltimore. This week at camp Lacey has taken more snaps with the ones — the presumptive starters. Last week, leading up to the preseason opener, it was Bentley getting those reps with Lacey inside at nickel. Bentley, a third-round draft pick, started the preseason opener last Friday at right corner and picked up one interception, nearly missing on another. Schwartz was critical of his play — and the play of most everyone — after that loss to the Cleveland Browns. Jeff Daniels, currently seen in HBO’s “The Newsroom”, was at training camp Wednesday. Usually once each season the actor, who is a huge Lions fan and lives in Chelsea, watches practice from the sidelines with the media. Schwartz commented on “Dumb and Dumber” which he called “comic genius.” There are rumblings that Daniels and Jim Carey will star in a sequel. ALLEN PARK — It was day 15 of Lions’ training camp and the casualties continue to mount, although none appear serious. Jeff Backus, who rarely misses a day of practice and never misses a game (he has 175 straight starts), sat out on Tuesday. Coach Jim Schwartz said it was a tight back. Backus has a broken thumb but has been playing through that. Tuesday it was mostly Jason Fox and Corey Hilliard taking reps at left tackle. Defensive tackle Corey Williams sat out today, joining Sammie Hill (back) who has missed three days. Linebacker Stephen Tulloch also was sidelined. Calvin Johnson, who got a day of rest on Monday, was back at work. So was WR Ryan Broyles who is fighting soreness in his knee following ACL surgery six months ago. Rookie Patrick Edwards (calf) also returned after missing two days. Still out were Kyle Vanden Bosch (back), Louis Delmas (knee), Mikel Leshoure (hamstring), Jahvid Best (concussion) and Jonathan Scott (knee). 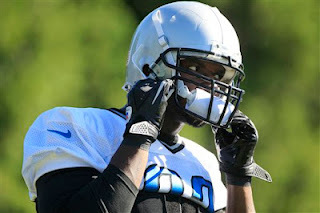 ALLEN PARK — Calvin Johnson missed practice today (Monday) and had his left index finger bandaged. He said it’s no big deal. “It’s football,’’ Johnson said. Coach Jim Schwartz said it was good to give Johnson a day off from camp because he doesn’t regulate himself, he goes all out. It’s the same with Kyle Vanden Bosch who twisted a knee last week. He goes all out in practice usually, but has been held out and didn’t play Friday. Schwartz said Vanden Bosch is week to week. Louis Delmas, who had surgery six days ago, watched practice from an outdoor balcony. Missing from practice were WR Patrick Edwards (calf), RB Mikel Leshoure (hamstring), RB Jahvid Best (concussion), LB Chris Greenwood (abdomen) and DT Sammie Hill (back). 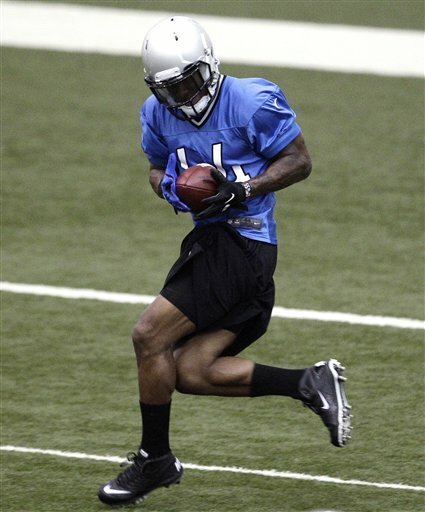 Titus Young was the standout at Monday’s practice making double moves on corners and displaying a high energy level. He was back at work after leaving Friday morning to head to California for the birth of his son, Titus Demetrius Young Jr. Young took the red eye back, landing in Detroit this morning. So he was fighting jet lag, but still had a great camp day and celebrated by signing numerous autographs afterward. More on Titus Young later today at TheOaklandPress.com. ALLEN PARK — Ryan Broyles was back on the practice field on Sunday after missing several practices and the preseason game with knee soreness. He’s six-plus months out for ACL knee surgery and there’s no need to rush him because the Lions have plenty of options at wide receiver. “He came out and worked, his knee has been sore. It doesn’t make sense to keep on going unless he was ready to go,’’ coach Jim Schwartz said. He had a good day at wide receiver and also lined up to return punts. “He knows how to get open, he’s not 100 percent physically, he knows how to get open and he showed it in practice today,’’ Schwartz said. Broyles, a second-round pick out of Oklahoma, has been working hard to meet his goal of being ready to start the season. Even when he’s not seeing action in practice he tries to make the most of it getting in those important mental reps.
Ronnell Lewis left Sunday’s practice early, unable to work through his bruised right shoulder. Trainers attended to him on the sideline. Linebacker Justin Durant, who injured his foot in Friday’s game, started practice but was not able to finish. Schwartz said neither injury is considered serious. Louis Delmas was at his locker after practice but wouldn’t talk about his situation. Delmas, who underwent surgery on his left knee on Tuesday, had a pair of crutches leaned up against his stall. Also, missing practice were Kyle Vanden Bosch (knee), Mikel Leshoure (hamstring), Jahvid Best (concussion), Patrick Edwards and Chris Greenwood (abdomen). Amari Spievey was back on the field after sitting out Friday’s game due to headaches. As a precaution, he was checked out to make sure they weren’t related to a past concussion. He was cleared to go but was lining up with Sean Jones in the backup group. John Wendling and Erik Coleman were still playing with the starters. Safety Reshard Langford, who was signed on Saturday, practiced. The numbers are down at safety due to Delmas’ knee injury. Linebacker Korey Bosworth was cut to make room for Langford. ... It was kids day on Sunday and they showed up big time. The official attendance was 2,819 which is significantly higher than a normal day of training camp. ... Rookie Bill Bentley was opposite Chris Houston at cornerback on Sunday with Jacob Lacey in at nickel. It was the same lineup as Friday’s game. DETROIT — Rookie Bill Bentley will start at right cornerback opposite Chris Houston in tonight's preseason opener against Cleveland. As expected, John Wendling will start at strong safety instead of Amari Spievey and Erik Coleman will start at free safety in place of the injured Louis Delmas (knee). Lawrence Jackson will start at left defensive end for Cliff Avril who is not ready to play due to his holdout. Willie Young will start in place of Kyle Vanden Bosch who is out with a knee injury. Titus Young was the only surprise among the inactives. He’s out due to the expected arrival of a child. Eleven players didn’t dress for the Lions in tonight's preseason opener against the Browns. The only surprise was Titus Young who was out due to the birth of his child. Out were safety Louis Delmas (knee), defensive end Kyle Vanden Bosch (knee), running back Jahvid Best (concussion), running back Mikel Leshoure (hamstring), safety Don Carey (unknown), T Jonathan Scott (knee), defensive tackle Sammie Hill (back), Chris Greenwood (abdomen) and wide receiver Ryan Broyles (knee). After holding out, Cliff Avril was not ready to return to action after just three practices, none of them in pads. — Rookie cornerback Bill Bentley expects to start. He made another interception in Thursday’s practice and has had a consistently good camp. He’s been lining up opposite Chris Houston with the starters. ALLEN PARK — Louis Delmas underwent a surgical procedure on Tuesday on his left knee, the team announced this morning (Wednesday). The surgery was performed by Dr. James Andrews of Birmingham, Ala., a pre-eminent orthopedic specialist. 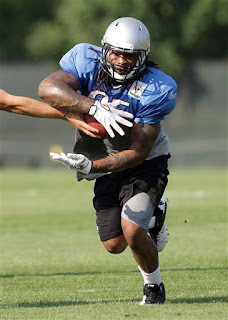 Delmas has missed the majority of training camp with knee soreness. He underwent knee surgery in December on his right knee. Obviously he won’t be ready for Friday’s preseason game. The team offered no other information. Coach Jim Schwartz may have more to say on the Delmas situation following this morning’s practice. Just a little over a week into Lions training camp, here’s a look at the rookies, a few who have been stand-outs. Some were drafted, others were signed as free agents. Positions like offensive tackle are a little tougher to judge until the preseason games. We’ll get our first look on Friday night at Ford Field against Cleveland. The creation of a champion begins each April and while it’s early, it looks like Martin Mayhew made some quality choices. — T Riley Reiff (first round, Iowa): At June’s minicamp offensive coordinator Scott Linehan said this guy will play early and often. He just didn’t say where. Through the start of camp, he’s taken reps at left and right tackle along with Jason Fox and Corey Hilliard. Teammates like him and his approach to the game. He’s got some great veterans like Jeff Backus to learn from. Bring on the preseason. — WR Ryan Broyles (second round, Oklahoma): He’s making remarkable strides after coming off ACL surgery more than six months ago. As long as he stays healthy, look for him to contribute right away. While three receivers are ahead of him on the depth chart, Linehan likes to mix it up and rotate guys on and off the field. He’s not going to let a talent like Broyles wither away on the bench. Like the other rookies, the preseason games will be huge for Broyles. — CB Bill Bentley (third round, Louisiana-Lafayette): He’s been one of the standouts of the rookie class so far. It’s not like he has an occasional good day at camp, for Bentley every day is a good day and he continues to improve. Perhaps a secret to his success, is when he gets beat by a receiver on a one-on-one drill, he’ll immediately ask the guy how he beat him. Speedy and athletic, he’s in the running to get the start at right cornerback. If not, he should be first in at nickelback. He’s played both positions with the starters every day in camp. — DE Ronnell Lewis (fourth round, Oklahoma): The pass-rushing specialist had a slow start to camp with a tight back. Known as “The Hammer” in college, Lewis is best known for his special teams play. That’s probably the only way he’ll make the 53-man roster this year. He has competition in Lawrence Jackson and Willie Young for the backup defensive end roles. Both of them young but are more experienced and continue to improve. — LB Tahir Whitehead (fifth round, Temple): So teammate Justin Durant said this guy is the “strongest dude he’s ever seen.” That should tell you something. There’s a four-way battle for a projected three backup spots at linebacker and it looks like Whitehead is making a strong case for one of them. — CB Chris Greenwood (fifth round, Albion): We can only give him an incomplete. Greenwood underwent abdominal surgery after getting injured in Organized Team Activities and he hasn’t been cleared to participate in camp. They like this athlete and I don’t expect they have given up on him. He’s just getting off to a slow start due to the injury. — CB Jonte Green (sixth round, New Mexico State): This corner hasn’t made an impact quite like Bentley. It is early in the process though. — LB Travis Lewis (seventh round, Oklahoma) — Another Sooner, another good camp so far. Lewis, who led Oklahoma in tackles for four seasons, has had a solid camp. He’s in the mix for one of the three backup linebacker positions. — WR Patrick Edwards (undrafted): He’s been one of the biggest surprises in camp, routinely makes quality catches. It’s going to be tough for him to make the 53-man roster because really there’s just one roster opening and several fighting for it including Mo Stovall, Dominique Curry, Lance Long, Nate Hughes and Terrence Tolliver — all who have experience. Edwards qualifies for the practice squad, but he may be too good for it. — QB Kellen Moore (undrafted, Boise State): He doesn’t have the arm strength, but he’s got football smarts and during camp he seems to make the most of his limited chances, often moving the ball downfield. He’s gained a big fan in offensive coordinator Scott Linehan. He’s a coach’s son which is usually a great line to put on the resume. There’s a chance the Lions won’t keep three quarterbacks (remember Drew Stanton didn’t dress for a game all last year), but if they do it will be Moore. R.J. Archer, who plays arena ball, is strictly a camp quarterback. It was the most amiable of hold-outs. Lions defensive end Cliff Avril missed the first week of training camp. Everyone knew he would eventually sign the $10.6 million tender and report to camp. That happened on Sunday morning according to an announcement from the Lions. General manager Martin Mayhew said he expected Avril to report he just didn’t know when. Avril, a veteran, is fully expected to report in shape. The next practice is tonight at Ford Field for the inaugural Coach’s Kickoff. Tickets are available at the gate. Avril and the team had been unable to agree to a long-term deal before the July 16 deadline. He made it clear that he would hold out from camp, in part to spare himself from injury. It was apparently a friendly negotiation process even though a deal was not reached. Mayhew had nothing but good things to say about Avril who is betting he’ll have another season like last year when he led the team with 11 sacks. He also had six forced fumbles, four pass defenses, an interception and a touchdown. By signing on Sunday, Avril will get in enough practices so he should be able to play in the opening preseason game on Friday at Ford Field against the Cleveland Browns. With his absence in camp, Lawrence Jackson and Willie Young had been getting more snaps. While young at age 26, Avril is a team leader. He’ll be welcomed back into the locker room. ALLEN PARK — Between the heat and what Lions coach Jim Schwartz calls “camp knee” more players did not make it through Friday’s practice. Wide receiver Ryan Broyles, who is coming off ACL surgery, was having trouble keeping the tape on his knee due to the humidity and sat out part of practice. Titus Young and Corey Williams also had that minor knee issue and didn’t finish. “We’ve got a lot of camp knees. No real injuries, just guys that get sore form a lot of reps,’’ Schwartz said. “... The whole idea, there’s a lot of things we want to push through, we want to push through when you’re hot, when you’re out of wind you need to be able to go. We don’t want to push through knee soreness or hamstrings,’’ the coach added. A few players, including Ronnell Lewis, had trouble with the heat and went in for intravenous fluids. Schwartz had no complaints about the heat and humidity. “It’s good from a standpoint of we’re not a hot weather city so when we get nice hot humid weather like this it’s great to practice in and great for our conditioning,’’ Schwartz said. Still out with injuries were Stephen Tulloch (tendonitis), Louis Delmas (knee), Jahvid Best (concussion) and Mikel Leshoure (hamstring). 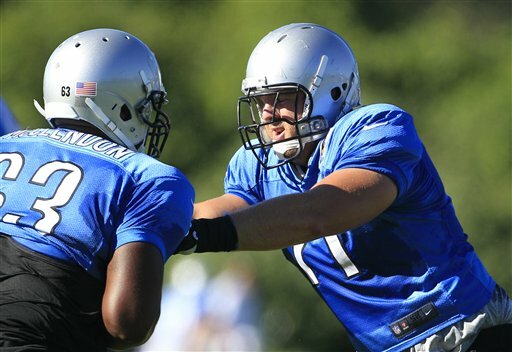 ALLEN PARK — Good news and bad news on the injury front at Lions’ training camp today. Left tackle Jeff Backus was back at work with his right thumb still in a cast and protective covering over it. Even though he’s a veteran, Backus did not want to miss any more days. There’s a difference from being in good shape to being in football shape. He’s working on getting to that next level. He said he’s played with broken fingers before, he just has to make adjustments. 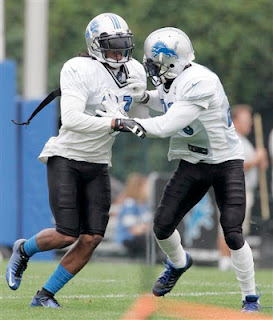 Still out were: Louis Delmas (knee), Jahvid Best (concussion), Mikel Leshoure (hamstring) and Chris Greenwood (abdomen). Safety Jacob Lacey was back at work after missing one day with an undisclosed injury. Also, tackle Jonathan Scott was spotted walking through the locker room using one crutch with a heavy brace on his right knee. Definitely not a good sign for him.